Cineaste: You’ve traveled with Cinema Paradiso to many different countries over the years. How do the reactions of audiences differ from place to place? Salvatore Cascio: Yes, I’ve been to many different places with the film, including Spain, Brazil, Algeria, and Japan, where it’s especially popular. And I have to say that I don’t see much difference in terms of the reactions of the audience. It seems that every country, every group, sees the film in a similar way. It’s a universal story that speaks to people. Young Salvatore Di Vita (Salvatore Cascio) learns about the magic of movies from Alfredo (Philippe Noiret), the projectionist at the Cinema Paradiso. Cascio: I’ve never phrased it like this before, but I would say that for me, over the years, it’s become like watching my son on the screen. Myself as my son, I mean. So I feel a lot of emotion, a lot of tenderness, when I watch the film now. And yes, I remember a lot from the shoot. When I see a scene, what we were doing on the day will come back to me clearly, memories of the set, and the people who were there. Cineaste: What was the audition process like for the film? Cascio: It was a big, long process. Tornatore was conducting a search in Palermo and nearby towns and cities for a child to star in the film. I’m from one of those places, Palazzo Adriano, and they held a casting there for over two hundred boys. In the end, it came down to just two of us, myself and another boy, who was a friend of mine. We lived five kilometers from each other. Eventually, I won the part; he was angry and we weren’t friends after that. The experience taught me that in some situations someone has to lose and it’s not easy. I understand his feelings, and I would have probably reacted the same way if it had been the other way around. We were just kids, after all. Later, Tornatore’s sister told me that he had known from the beginning that he’d wanted to cast me, that there was some quality in me that he thought was right for the role. Cineaste: Once you started shooting, how did Tornatore direct you? I heard him say that he tried to make it like a game for you, to retain a spirit of play as much as possible. Cascio: A child on a film set can be like a bomb, ready to explode at any time. So casting a child, especially in a major part, is always a risk. There are times when you just want to play and not work, and I definitely had my naughty moments on the set. Tornatore is a perfectionist. We’d start at 7:00 a.m. and often work late into the night. Sometimes we’d do many takes for a scene. I remember in particular the scene of Alfredo [Philippe Noiret] and I coming back on the bike. That was a day that my parents and friends were visiting the set. I was feeling quite full of myself—that childish feeling of “I’m a star now”—and not doing my best work. We ended up having to do about twenty takes for the scene. When Tornatore wasn’t satisfied with my performance, he’d say to me, “Cristaldi [the film’s producer] in Rome aren’t happy and they want to replace you.” Of course, now I understand that he was saying it to push me, to make my work better. But it was hard to hear at the time. Salvatore Cascio acknowledges that this scene took many takes to complete. Cineaste: Do you feel that he pushed you too much? Cascio: No. I place Tornatore alongside my father as a central male figure in my life. Any qualities that I feel are the best in me were discovered by them. Tornatore always made time on the set for us to relax, play, and have fun. There were many light and enjoyable moments amidst the work. Cineaste: Speaking of father figures, how was working with Philippe Noiret? Cascio: If Tornatore was a father figure, then Noiret was like a grandfather to me, very affectionate, very nice. The only problem, of course, was that he didn’t speak Italian. There was a translator with him on set, and I’d be given the last lines of a scene in Italian so I could understand what he was saying and we could have a dynamic. Even though he didn’t speak Italian, we were able to communicate. Cineaste: Did it feel natural to you to be in front of the camera? Cascio: Mostly, yes, it did, because it seemed like a game. But repeating things through many takes was a challenge because it’s easy to lose spontaneity when you have to do things over and over. But the bigger challenge comes later, in a way, after the shooting is finished. If your parents, or you as a child, think that being in a film is just a path to financial success, a way to become rich and famous, then you’re lost. We were simple people, and I’m happy that for me it managed to remain fun and a game. Cineaste: How did you feel when you watched the film for the first time: not only your scenes, but the later parts in which you don’t appear? Cascio: Watching the film for the first time was a terrible experience for me. I was a shy boy at heart and it was very hard to see myself on screen. Later, though, it became easier. I could detach myself, and what interested me was the continuity I perceived between the “three Totòs”—the child, the teenager, and the adult. Part of the magic of the movie, for me, is that I feel like the three Totòs were one. I don’t know if the other actors [Marco Leonardi and Jacques Perrin] feel the same way, but even as a child watching it I felt the connection. That’s the reason I prefer the complete cut of the film, rather than the shorter version. It’s important to see the whole journey of the character. The adult Salvatore (Jacques Perrin), now a film director, returns to his Sicilian village to attend Alfredo's funeral, and receives a special bequest from his old friend. Cineaste: What are your memories of coming to London and winning the BAFTA Award for Best Supporting Actor for your performance? Cascio: I went to the BAFTAs with my father. It was a big ceremony, a huge gala with a lot of stars. To be honest, I felt a bit overwhelmed and a bit sad somehow. I remember my father cracking jokes and trying to make me laugh but I resisted his efforts. The only moment that I felt really happy that night was the moment of getting the award. I don’t remember who gave me the prize, only that Al Pacino was nominated in the same category. Cineaste: Yes, you beat Pacino. Cascio: I’m shaking when I think about it now, but at the time it seemed pretty normal! More recently I learned that only two Italians got BAFTA acting awards: myself and Roberto Benigni for Life is Beautiful. So it’s quite special for Italians because it’s not very common. Salvatore wins the BAFTA (British Academy of Film and Television Arts) Award for Best Supporting Actor for his role in Cinema Paradiso. Cineaste: I also wanted to ask about some of the films you made after Cinema Paradiso and how those experiences compared. Cascio: Yes, I did a few. Breath of Life  with Vanessa Redgrave, Franco Nero, and Fernando Rey; There Was a Castle with 40 Dogs  with Peter Ustinov; and Everybody’s Fine , again for Tornatore, with Marcello Mastroianni. Cineaste: How was Mastroianni to work with? Cascio: A proper gentleman. He’d always arrive on time, or before time, and would talk to everyone. He set a tone that proved contagious for the whole group of us. In his acting he was simple, clear, precise. I also did some TV series, quite stereotyped, on Mafia subjects. They were very popular in Germany. One project was unlucky: a film called Jackpot , by Mario Orfini, with Christopher Lee and Adriano Celentano. Celentano was a huge star in Italy, known mostly as a singer, so it was a big deal to be in a film with him. The film had a considerable budget and a lot of potential but it just tanked at the box office. Still, like Tornatore, Celentano is one of those people who is always close to my heart. Cineaste: How was Christopher Lee? Cascio: Serious! We shot Jackpot in Rome and also in Lake Como. I was there with my mother and younger brother and we were bored sometimes. We wanted to play football but the producers wouldn’t let us go to the little stadium nearby, in case we got injured somehow and ended up costing the film something. So they said we could play in the hotel. We were on the same floor where Christopher Lee was staying with his wife and we started playing football there in the hall. Christopher Lee called us “savages!” and told us, “please stop!” The guys in the hotel were fine with it and took any expensive stuff away. But Christopher Lee wasn’t happy with us. Cineaste: One film you didn’t mention is The Pope Must Die . Cascio: I’ve never seen the finished film, but making it was a good experience. We shot it in Dubrovnik, just before the terrible Balkan War in the ’90s. I remember how beautiful the city was. The film itself was a strong satire but, perhaps for that reason, it wasn’t distributed in Italy. Cineaste: Tell me about your life after cinema. Did you decide not to pursue a career in acting, or did the parts stop coming? Cascio: I had a difficult adolescence, really. I wasn’t that lively, spontaneous boy from Cinema Paradiso any more and it was hard for me to find my place. In more recent years, I feel like I found the connection back to that boy again, but at that moment it was lost, and I guess it had to be. To be honest, it was never my dream to be an actor. I had great experiences, for sure, but as I became a teenager I was changing and I felt that acting wasn’t what I wanted to do. My father worked in grocery shops when I was growing up. It was his dream to start a hotel, and we made the decision to start the restaurant and B&B and run it as a family business. The name is “The Oscar for Taste” (“L’Oscar dei Sapori”). The decoration has some memorabilia from Cinema Paradiso. That’s true elsewhere in the town, too, where there’s a small museum connected to the film. Cineaste: So, even in your new life and career there’s a strong connection to your acting past. Cascio: Yes, Cinema Paradiso remains very present in my life. It’s hard to go back from such an experience and I wouldn’t want to. I appreciate what the film means to people, and I know that a part of me will always be this character. 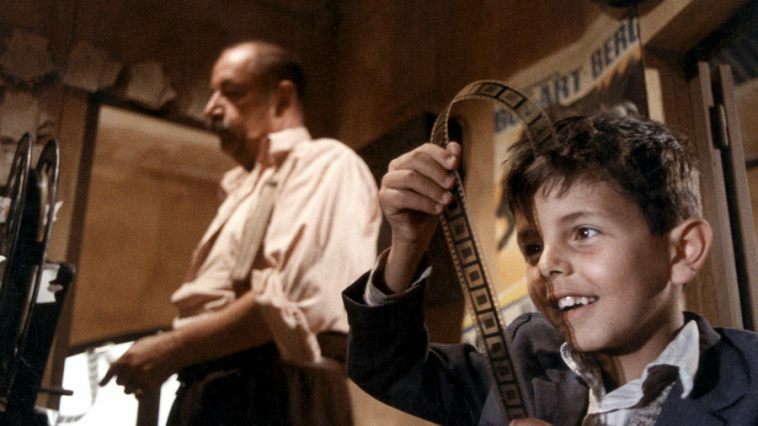 Salvatore (Salvatore Cascio, center) is one of many entranced youngsters who attend screenings at the local cinema in Guiseppe Tornatore’s Cinema Paradiso. Cineaste: Do you think you’d ever like to act again? Cascio: I’d be lying if I said a definite “no.” There’s an Italian saying—“Chi vivrà vedrà” (“Time will tell”). I guess it’s something that’s still inside me. For sure, if Tornatore came to me suggesting a role or a cameo, I’d do it for free. With Tornatore, I can say that we have a deep relationship. It’s not like we see each other so much, but when we do it’s as if no time has passed. 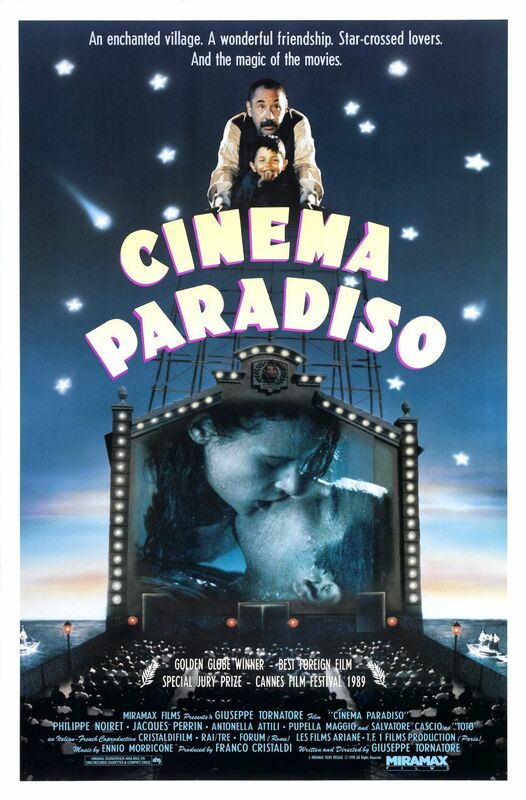 Cineaste: Cinema Paradiso is about the passing of time in relation to film culture. The film expresses nostalgia for cinema as a community activity. What do you think about the way in which people tend to consume films nowadays, which seems to work against that sense of togetherness? Cascio: It’s true that streaming services like Netflix, or Sky in Italy, are very popular. You’re right that Cinema Paradiso is about the human aspect of cinema, a time when it was clearly a community-making force. The main difference for me in seeing a film in the cinema or at home is the question of atmosphere. The parallel I’d make is between watching a football match in a stadium and watching it on TV. You can’t beat that feeling of being with people you don’t know, of sharing something together, maybe even clapping at the end. For me that special feeling will never change, and I hope that it will never die. Cineaste: What’s your opinion of Italian cinema today? Cascio: I love Italian comedies and we have a strong tradition of those. We mentioned Benigni before, and I like his films a lot, not only Life is Beautiful. Other directors, like Carlo Verdone, aren’t so well known abroad but their films give me a lot of pleasure. In terms of quality cinema, we have a lot of talent, but the problem is selling our films: it often happens that they are not seen as widely as they should be internationally. Cineaste: Cinema Paradiso has certainly been widely seen and you said that people across the world respond to it in a similar way. In your years of traveling with the film did you reach any conclusion about why that is, and what precisely people respond to in this film? Cascio: I was thinking about this before coming here to Łódź. We’re celebrating thirty years of the film now, and we’re still talking about it with the same interest and passion. It seems that new generations are falling in love with the film. I think it is precisely the theme of love that resonates for people. The key for me is the scene in which Alfredo tells Totò that he, Totò, has to leave the town, that he has to go his own way and find his own path. And that everything he does from that moment he should do with love. Alfredo gives him that advice because he loves him and believes in him. We’ve been sitting here talking for an hour. For me, it’s one of those moments that I’ll cherish for a long time. Why? Because I’m here talking to you from the bottom of my heart. You’re asking questions with love and our translator [Diana Dąbrowska] is translating them with love. Maybe it sounds simple but that’s what I think Cinema Paradiso has given to people and what it still gives: a message of love. 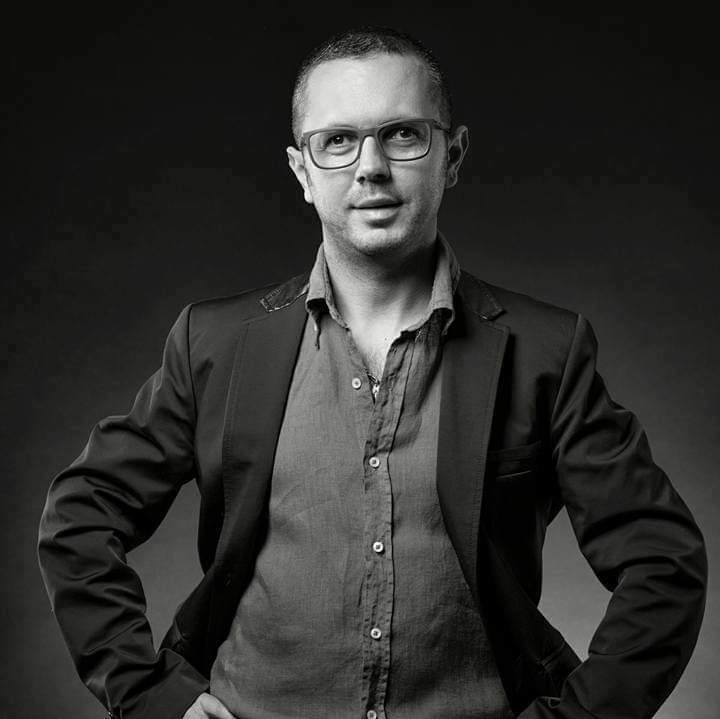 Alex Ramon is a critic and lecturer based in Łódź, Poland, who has written for the British Film Institute, Sight & Sound, and Film International.